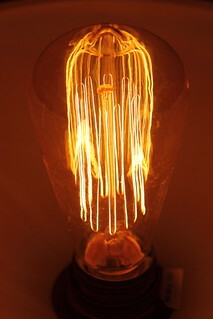 Carbon filament lamp - just bought three of these babies for use in our outdoor lantern. This is the type of incandescent lamp pioneered in the 19th century. I love them - they emit such a soft, warm light and the filaments are woven in a nice pattern.